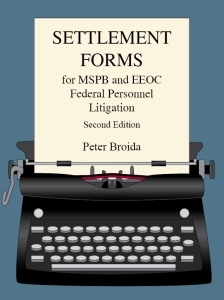 Written by Peter Broida, a long-time practitioner before the MSPB and EEOC, Settlement Forms for MSPB and EEOC Federal Personnel Litigation provides examples of settlement clauses, drawn from actual settlement agreements, to help practitioners structure agreements. Practice tips offer explanations concerning the more significant settlement provisions and those that often prove to be problematic. Major settlement provisions are grouped by settlement topics and categorized alphabetically. Also included is a detailed table of contents.